Denise Buethe is a BFIT teacher at ESU 4. The program is based in Humboldt at the HTRS Public Schools. Denise is rejoining the ESU 4 team after serving as a high school Special Education teacher at Auburn Public Schools for the past six years. Prior to teaching at Auburn, Denise was a Speech/Language teacher for ESU 4 from 2007-2011, serving the schools of Johnson-Brock, Sterling, Lewiston, Syracuse, and the ESU 4 Life Skills. 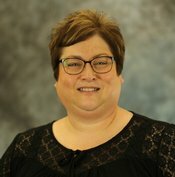 Denise earned her Masters Degree in Special Education in August of 2014 from Concordia University, as well as, a Bachelors Degree in Criminal Justice from Kearney State College in 1989 and her K-8 Teaching Endorsement from the University of Nebraska at Kearney in 2001. Denise enjoys spending time with her family who live in the Kearney area. Her husband, Brad, farms south of Tecumseh and is also a crop insurance adjuster with ArmTech. Denise is the proud aunt of Morgan, Lauren, Riley, and Cambrie and is an even prouder great-aunt to Evelynn and Madilynn.